Here is a special posting, a review written by frequent guest critic and writer for this blog, John W. Barker. Barker (below) is an emeritus professor of Medieval history at the University of Wisconsin-Madison. He also is a well-known classical music critic who writes for Isthmus and the American Record Guide, and who hosts an early music show every third Sunday morning on WORT 88.9 FM. He serves on the Board of Advisors for the Madison Early Music Festival and frequently gives pre-concert lectures in Madison. 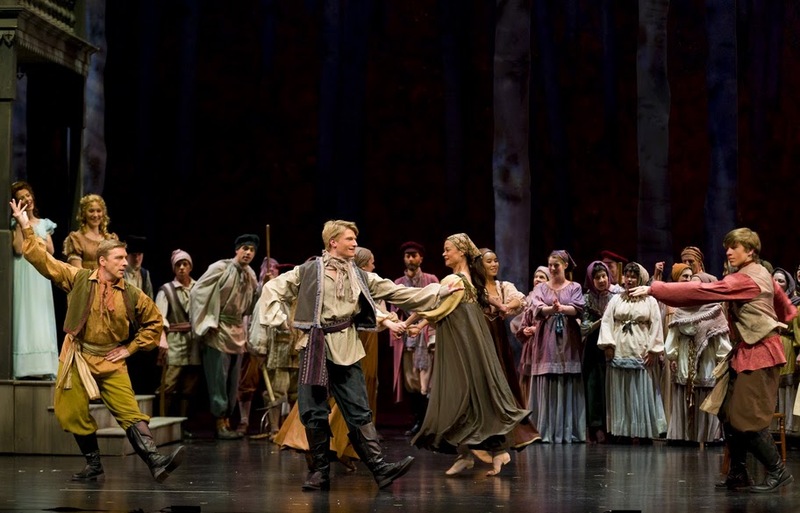 A couple of seasons ago, the Madison Opera broke one barrier by at last producing an opera by Wagner — “The Flying Dutchman.” Now the company has broken another by presenting a Russian opera, in Russian with English supertitles. The choice was both valiant and wise. 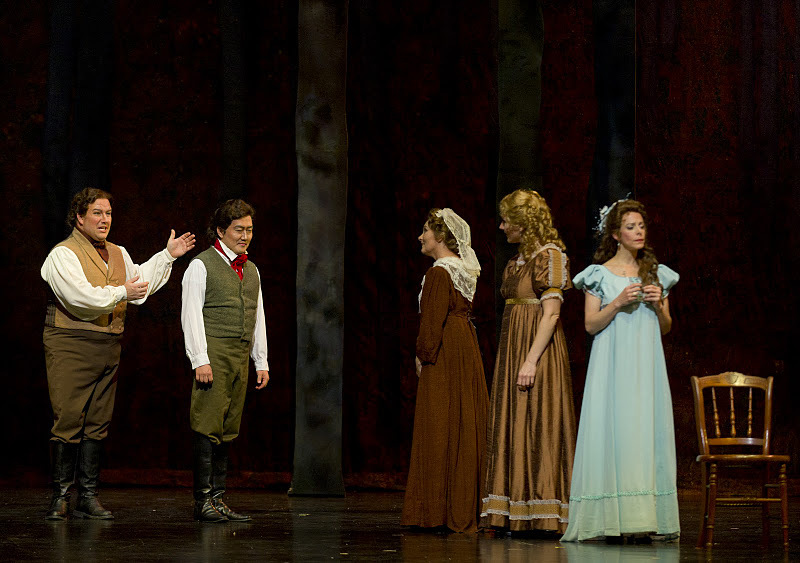 Tchaikovsky‘s “Eugene Onegin” is one of the greatest of Russian operas. It also happens to be one of my own very favorite operas of any flavor. It displays, further, three of the most appealing and sympathetic characters in all opera, to my taste. There is Tatiana (below left, in a photo by James Gill), the fragile adolescent heroine who falls imprudently in love with the title character (below right), is rejected by him and matures into an honorable woman who eventually is able to reject him. 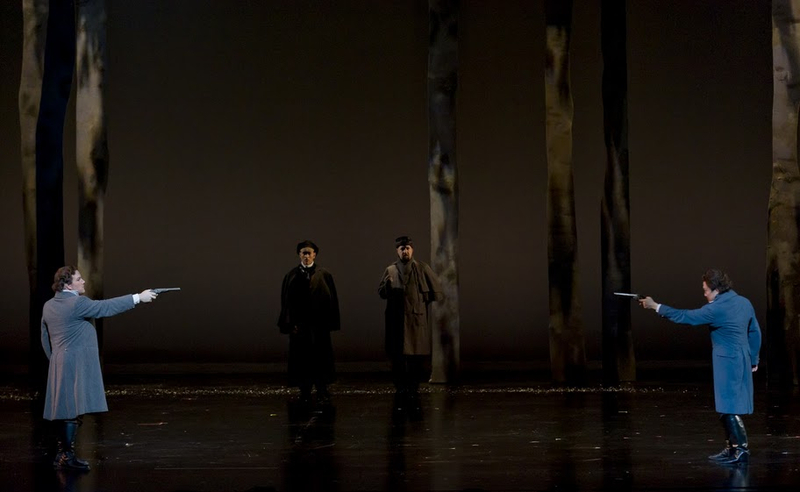 There is Lenski, the impetuous poet who throws away his life in a needless duel (below, in a photo by James Gill)) with his former friend, Onegin. And there is Prince Gremin, the aging warrior who can find rejuvenating love as Tatiana’s husband. There are even some other interesting characters beyond those three. And all this is presented in a glorious score that pours out melodies in Tchaikovsky’s characteristic orchestral richness (at bottom). Fortunately, conductor John DeMain was able to assemble a really splendid American cast (below, in a photo by James Gill) that could do full justice to both the music and the drama of this work. Soprano Maria Kanyova, with strong clarity of voice and committed acting conveyed the emotional turmoil of this vulnerable but honest woman who moves from adolescence to womanhood before our eyes. The versatile tenor Scott Ramsay portrayed the ardor of the doomed poet — a frighteningly prophetic foreshadowing of the needless death-by-duel of the great poet Pushkin, on whose verse novel the opera’s libretto was freely based. With his strong bass voice, Harold Wilson was ideal as the admirable Gremin, making the most of the character’s one memorable scene. Among other visitors was the returning Korean-born baritone Hyung Yun, who made as believable as possible the unsympathetic title character, showing dramatic skill and particularly fine Russian diction in his strong vocal projection. 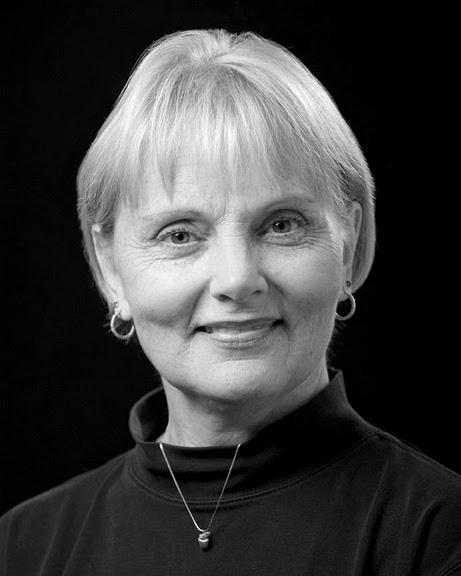 It was a treat also to have Jane Shaulis (below), a familiar veteran of Metropolitan Opera and New York City Opera productions, as the lovable old servant and nanny, Filipevna. Notable also, however, were three singers well known locally, in telling roles. Drawn in as a late replacement, and singing her first role in Russian, Allisanne Apple (below top) was a light-voiced but quite endearing Mme. Larina, Tatiana’s mother. Mezzo Jamie Van Eyck, who has matured wonderfully since her student days here, made a vivid figure, strongly sung, out of Olga, Tatiana’s easy-going sister. And versatile Madison regular Andrew Abrams (below) was simply delicious as the comic Frenchman Triquet — who was allowed to sing his florid poem in French, as Tchaikovsky intended. Chorus Master Anthony Cao managed to work his 43-member chorus into a quite credibly Russian-sounding body. DeMain had his seasoned Madison Symphony Orchestra players ready for polished realization of Tchaikovsky’s pit magic. 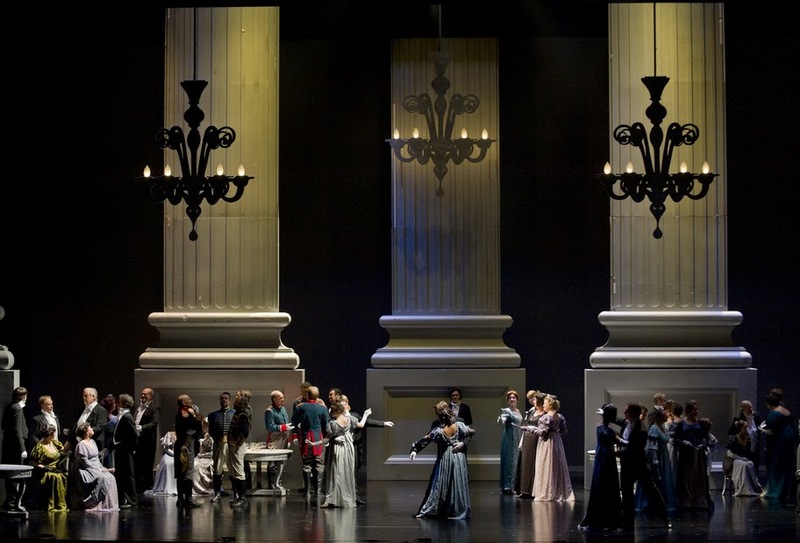 The sets (below, in a photo by James Gill), designed for the Vancouver Opera, succeeded in capturing very handsomely the diverse scene settings. Working within them, stage director and choreographer Candace Evans, a Madison native, achieved a flowing unfolding of the drama, with no end of very clever, often subtle details. My one objection, however, was to her excessive introduction of a team of dancers into the action. Their ostentatious balletic prancings became an increasing distraction and irrelevance, completely destroying the individually characterized dances that Tchaikovsky provided for the full cast, notably the mazurka (below, in a photo by James Gill) in Mme. Larina’s party and the polonaise and ecossaise in the grand ball scene. That one distortion aside, the production was a triumph of high-quality opera, in both material and its realization. Once again, the Madison Opera has shown that it can achieve results up to the best big-city standards. I’m so happy to find John’s review here. I was wondering where it was on the Daily Page and am glad to track it down. I enjoyed this opera quite a bit more than I thought I would (having sung some Russian in the past, my view of what Russian singing was like was apparently a bit distorted). 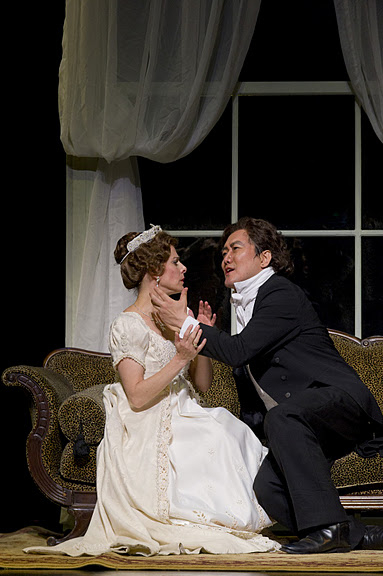 “Onegin” went surprisingly fast, and I was impressed by the acting.